This magazine is for chambers that are specifically cut longer than normal chambers. Fits long action bolt rifles and feeds the heavy bullet 300 Win Mag loads and others that are in the same cartridge family. 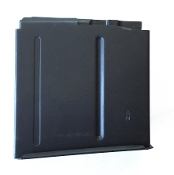 This magazine fits all McRee rifle stocks designated XL and aftermarket bottom metals set up for the NATO/AI CIP style magazines. If you are not sure if your action/reciever is set up for this length of cartridge do not order until you know.